Eris, the goddess of discord and strife and the most massive dwarf planet, is up to her usual tricks. On Friday night Eris was predicted to pass directly in front of a relatively faint star in the constellation of Cetus. You might think that this sort of thing happens all of the time, but you’d be wrong. Eris is so small in the sky and stars are such tiny points of light that, though they get close frequently, their actually intersections are rare. When they do intersect, though, something amazing happens: the star disappears. And since we know how fast Eris is moving across the sky, seeing how long the star disappears gives us a very precise measure of the size of Eris. Or, to be more exact, a very precise measure of a single chord passing through the body. Predicting that such an event is going to take place is a lot of hard work. Teams of astronomers around the world continuously measure and refine the orbit of Eris (and other objects out in the Kuiper belt) and carefully pinpoint the positions of stars potentially in its path. When a collision (ok, “occultation” is the right word here) looks possible, more and more effort is put into better understanding the precise location of the star and alerts go out throughout the world to try to watch a disappearing star. The predicted size and path of the shadow of Eris. South America was the mostly likely location to make a good detection, but the uncertainties in the position of Eris and the star might have put the shadow as far north as N. America or even down in Argentina. There is one important catch. Even if every single telescope in the world were watching, most would not see a thing. That’s because Eris is so small that if it is blocking the star from one spot on the earth it is not blocking it from most others. The easiest way to think of this is to imagine that that one star being occulted is the only star in the entire sky and it is super bright. As Eris moves in front of the star it makes a shadow on the earth, and that shadow is the size of Eris itself. Eris has a diameter about 5 times smaller than that of the earth, so the shadow covers an area something like 5 times 5 = 25 times smaller than the earth itself. It’s not quite that bad, though, because, like a lunar eclipse, the shadow of Eris sweeps across the face of the earth, making a track that looks something like the picture here. It’s hard enough knowing that Eris is going to occult the star. Knowing precisely where on earth to be to see the occultation is even harder. So on Friday night, dozens of astronomers from Europe, South America and North America all watched one little spot in the sky to see if a faint star would disappear. I gave it a try myself from my robotically controlled 0.6 meter telescope at Palomar Observatory (which I operated remotely while making dinner for me and Lilah), though the star was so low in a still-bright evening sky at the time of the predicted occultation that I wouldn’t have been able to tell one way or another if anything happened. Dozens might seem like a large number of astronomers, but it’s not enough to blanket the entire earth; there were gaps between telescopes where the shadow could pass and we would never know. We would require some luck. And, happily, we got lucky. The first positive report came from Sebastian Sarabia, Alain Maury and Caisey Harlingten at the San Pedro de Atacama Celestial Explorations Observatory in Chile, who saw the star disappear for 76 seconds. Later it was reported that Emmanuel Jehin at the TRAPPIST telescope, about 700 km south in La Silla Chile also saw the star disappear. This means we’re in business. While each single detection gives you only one chord across the body, it only takes two different chords to precisely define the size of a circle. And since we are pretty certain Eris is massive enough to be spherical (Pluto, only 80% the mass of Eris, is spherical), that means a size can be measured. Yes! This is huge! Most of the ways we have of measuring the sizes of objects in the outer solar system are fraught with difficulties. But, precisely timed occultations like these have the potential to provide incredibly precise answers. The earliest measurement came from trying to infer the size of Eris by measuring the total amount of heat coming from it, kind of like closing your eyes and holding your hold out and trying to tell the difference between a small flame and a huge bonfire next to you. Those early results – as you might guess -- had large uncertainties but suggested a diameter of 3000 km with an uncertainty of 400 km, making it comfortably larger than Pluto, with a radius of about 2300 km. Soon after, my students and I obtained some beautiful images with the (now, sadly, defunct) High Resolution Camera on the Hubble Space Telescope. These images allowed us to (just barely) measure the size of the tiny disk of Eris. We found that our best measurement gave Eris a diameter of 2400 km with an uncertainty of 100 km. This means that Eris is, within the uncertainties, more or less the same size as Pluto! Later measurement of the orbit of Dysnomia showed that Eris is a 25% more massive than Pluto, so, still a more substantial body, but their sizes could be remarkably similar. Of course, if they are the same size by Eris is more massive that must mean that Eris contains considerably more rock in its interior than Pluto. I can’t think of any good reason for this to be true, so my best guess for the past few years has been that Pluto and Eris have similar interiors and that Eris is 25% more massive because it is 7% larger. That would suggest a diameter for Eris around 2480 km, which is well within our measurement uncertainties and not too far off of the thermal measurements. If you had asked me to bet on Eris’s true size a week ago, this is what my bet would have been. I would even have bet a lot of money. Too bad you didn’t take that bet a week ago, because you could have won some money. [update: the final analysis of these data say Eris is 2326 +/- 12 km in diameter]. Sadly, the uncertainties in these occultation measurements are larger than they might have been; the only detections of the occultations came from fairly small telescopes, which means that to detect the faint star they had to take long exposures. Long exposures mean that you don’t know as precisely when the star appeared and disappeared. With the success of these observations, though, bigger telescopes are now likely to try to get in on the action. One or two good occultations with big telescopes taking fast data, and we will know the diameter a Eris even better than we currently know the diameter of Pluto. I can’t wait. Though the results from Friday are preliminary and not as precise as I would like, it is still fun to speculate on what they might mean. If these preliminary results stand up, Eris and Pluto are very different bodies. Though Eris is substantially more massive, they are essentially the same size. Eris must be made almost entirely of rock with a little coating of frost – which we see – on the outside. How could Eris and Pluto look so similar in size and exterior composition yet be totally unalike on the inside? As of today I have absolutely no idea. Two other large objects in the outer solar system – Haumea and Quaoar – also appear to be mostly rocky with a little ice on the outside. In the past we’ve been willing to make up special explanations for them. But Eris, too? Having to continue making up special explanations is becoming unpalatable. Something is going on in the outer solar system, and I don’t know what. What’s next? We are all eagerly awaiting a more precise analysis of the results to see what they really show. Eris reveals her secrets slowly, but we now already know so much more about that little world than we did on that moment in January 2005 when we first saw her crawling across the sky. And there will be more to come. We don’t yet know when or where, but, once again, some astronomer will be watching a faint star in the constellation of Cetus suddenly blink out as the next shadow of Eris crosses the face of the earth and the exploration of the most massive dwarf planet will continue. Next up: What does all of this mean for the dwarf planets and the solar system? A most fascinating astronomy story (and lesson). Thanks Mike. So what's the problem with different masses with same diameter? As I was reading I first thought: "well, they may be made of different minerals, say iron and carbonates" (oversimplified). But it seems you don't buy this and that your emphasis is in the different apportion of water ice they must have, with Pluto being much more icy than the others. So let me ask you this: why is the problem then with the "dehydrated" objects and not with Pluto? Is there any particular reason to expect these objects to have large amounts of water? As high school students in the 1960's, we tried to figure out the path of a lunar occultation of a star. We planned it and on one very cold winter evening spent a frigid night in a snow-filled corn field watching and timing the event, then sent our results in to Sky and Telescope magazine. We made the magazine story as the astronomy club that got it wrong. That would have been a lot easier than what you've just accomplished! In the Atacama animation you show I notice that even while the star is occulted a few bright pixels continue to flicker around at it's location. What's going on? Diffraction? Atmosphere(surely not)? Some instrumental effect? @Maju: really, what I would have expected is that everything would be the same. The fact that there is SO much variation is really quite baffling. We've known Pluto's density for so long that it is easy to think of it as "normal" but you're right; I'm not even sure what normal means anymore out there. @nunn: Sharp eyes! What you're seeing is Eris itself. Eris is fainter than the star it occulted by not by much, so when the star disappears all that is left is Eris. If you came back a few hours later you would see the faint Eris a few pixel away still moving along. Would a primarily rocky Eris be proof it was formed much closer to the sun before being ejected out? Wikisky shows that the target star was mag 17.25 but asteroidoccultation.com seems to show the target star as mag 15.6. Which was it? Why can't this increased density simply be the result of Eris forming inside the protostar Sol's frost line, then being gravitationally ejected to its current elliptical orbit? While it may feel too convenient to invoke this explanation frequently, it seems that the only plausible outcomes of inner planetary formation are accretion (us) and ejection (them). We do have four gravitational giants in our outer system. This could explain the relative paucity of ice-laden planetesimals. Perhaps they were accreted at a greater rate than their inner rocky siblings. Anyway Dysnomia is probably a potatoe shape so its diameter is an estimation, which influences further mathematics on the subject. As stated, we’re looking at “preliminary results” ! CT has a good point. Maybe Eris was an inner rocky protoplanet that was scattered to the outer solar system, where-as Pluto may just be an overgrown icy comet scattered to the outer solar system when Neptune and Uranus swapped places. Besides, Jupiter can throw objects farther than Neptune can. In Sol's early days, wasn't it in a cluster environment where interaction with neighboring stars was much more likely? So an outer family of bodies depleted in volatiles would be much less surprising if another star or stars were present to "burn off" some of the lighter elements, particularly if these stars were a bit older or brighter than the Sun. Conveniently, this scenario is already invoked as a possible explanation for Sedna. I don't have the tools to work up the likelihood, but it's just a thought. We try to observe the Eris occultation here ( Fortaleza city - Brazil) but the clouds did not allow us. At one point in the article you say, "...making it comfortably larger than Pluto, with a radius of about 2300 km", but I think you mean diameter, not radius. Maybe someone should send a cheap probe with the New Horizon sensory package to get some definite measurements. Think a Falcon 9 Heavy rocket with a pair of tandemly stacked Centaur upper stages along with an Ion propulsion module should send a smaller refined version of the New Horizon probe to Eris in about a decade with some gravity sling shot assist from the Jovian planets. Just need a Billionaire with a quarter billion bucks handy for the 2 decade life cycle cost of an Eris encounter probe. Would Mike Brown have any comments of this slightly far fletch proposal? How can Pluto be considered an icy comet if it is 75 percent rock, as is estimated by the New Horizons mission? Eris is even more rocky since it has a higher density. This supports both of them being small planets. Eris has a very little angular diameter and is moving very slowly in the sky, so how rare are star's occultation? Was the previous week event the first from the Eris discovery? Paolo: The occultations are rare, but there should be attempts like this every year or so. Still, it is nice to get lucky and have telescopes right in the right place! I like PiS hypothesis, since it predicts so much. Now, how to test it, I come up empty. "This supports both of them being small planets." That depends on how you define a planet (and now there is a rigorous definition), but I've never seen the fraction of rock used. There is even speculations of all or mostly water planets out there. Still strictly exoplanets not planets, but even today the current requirements for planethood is testable in some cases so one is forced to have an open mind on these things. I would like to see a stellar occultation of Makemake for comparison purposes (Mike would, too). We have no real idea what it's density is, it's a big mystery. I suspect Makemake is very different from the other large objects. It has no moons and is redder. Maybe Eris and Pluto have a frost/condensation cycle that keeps burying the reddish UV-baked tholins under fresh frost, and in the case of Makemake we see something very ancient. Pluto's atmosphere might condense into a frost a few millimeters thick, which would radically change it's appearance. I read somewhere recently that Pluto has indeed changed it's appearance since Vogt et. al's fantastic map of the object from when Charon and Pluto were undergoing mutual occultations. But what we see today is pretty fuzzy compared to that map. 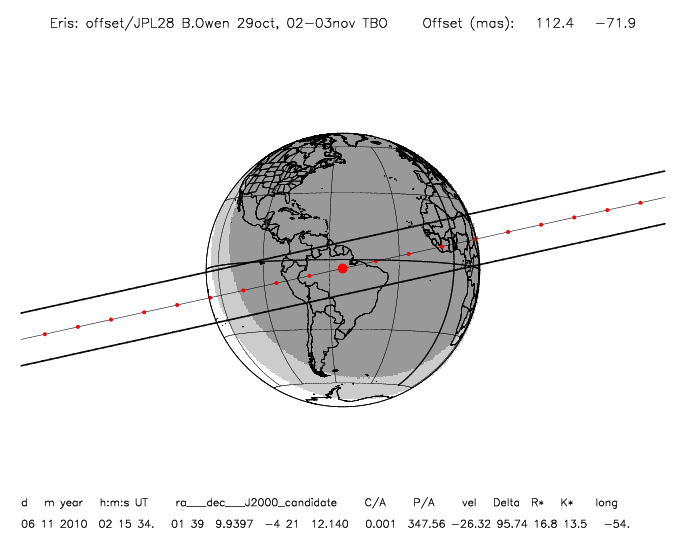 Speaking of occultations and maps, how is the Haumea mapping project coming along? I haven't heard any word on that lately. Hmmm, that's a quarter billion dollars not a billion dollars spread over a period of 20+ years. Comes to about a little over 12 million dollars annually. In comparison, about a fraction of the annual aircraft attrition write off from the USAF alone. Could Eris be an ellipsoid? It says in the article that two chords were detected, and that "...it only takes two different chords to precisely define the size of a circle". That's true. "A 28-second occultation of an 11.1 magnitude star by Varuna was observed from Camalau, Paraiba, Brazil, on the night of February 19, 2010. Results of the 2010 occultation as seen from Sao Luis with a duration of 52.5 seconds corresponds with a chord of 1003 km. But Quixadá 255 km away had a negative result suggesting a significantly elongated shape is required for Varuna. Since the occultation occurred near Varuna's maximum brightness, the occultation was observing the maximum apparent surface area for an ellipsoidal shape." As mentioned in the article, the baseline for the Eris measurements is 700 km. That's enough room for the short axis to pass the area of observation. That would give a smaller than real size for Eris. I sure wish we had a third (& fourth +) chord. Some asteroid occultations have resulted in several chords. They usually pass over the United States. Since I think Eris is a separated binary and have done simulations of the separation of binaries, I can easily imagine Eris spinning rather rapidly. Since Eris has not shown any variation in it's light curve, for this situation to come to pass the axis of rotation would have to be pointed towards the Earth. It would help also if Eris wasn't stretched quite as radically as Haumea or Varuna. You might expect Dysnomia's orbit to be aligned perpendicular to the spin axis of Eris due to tidal effects. I've seen a map of Dysnomia's orbit and it's a pretty fat ellipsoid, meaning we see it close to pole-on. But it's not a cirle. If Eris is spinning with it's pole pointed pretty much in the direction of Earth, this will have an effect on the thermal measurements taken when IR/visual comparisons were the only method of determining it's size. Pole on would mean that the surface we see would be significantly warmer than if we were viewing it's equator. And that would account for some of the earlier oversized estimates. Were the integration times too long to learn anything about the atmosphere?